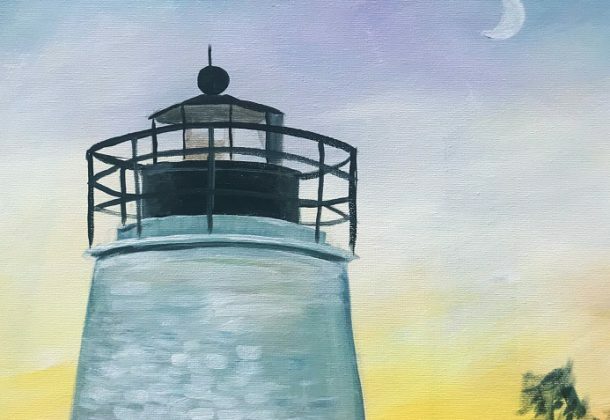 The Friends of St. Clement’s Island and Piney Point Museums at the Piney Point Lighthouse Museum & Historic Park invite the public to a fun morning of guided painting of the Piney Point Lighthouse … courtesy of Wine and Design Leonardtown. The event takes place at 10 am Sunday, Sept. 9, 2018. Weather permitting, painting will take place outdoors next to the lighthouse along the picturesque Potomac River on Piney Point to help spark the creativity of participants. Though wine will not be provided at this event, guests are encourages to come out to support the Friends group, which raises funds to support historical interpretation, educational programs, and specials needs of the sites managed by the Museum Division of St. Mary’s County Department of Recreation and Parks. The price is $45 per person, with proceeds going toward the Friends’ mission. The Piney Point Lighthouse Museum is located at 44720 Lighthouse Road in Piney Point, Maryland. For more information or to sign up for the Sept. 9 event, click here. To learn more about Lexington Park, visit the St. Mary’s County Community Development Corporation’s Leader member page.